New types of cigarettes and tobacco threaten to addict a new generation of kids, in spite of the country’s overall progress against smoking, said Tom Frieden, director of the Centers for Disease Control and Prevention. This entry was posted in Tobacco-Free Living and tagged Tobacco-Free Living on November 8, 2013 by beth. People who don’t have a grocery store nearby are often left to settle for fast food choices that are less healthy. But a mobile food truck stocked with everything from chia seeds to collard greens is ensuring that rural residents have a leg up on better nutrition. This entry was posted in Healthy Eating and tagged Healthy Eating on November 8, 2013 by beth. Getting regular daily exercise of moderate to vigorous intensity may also boost students’ academic performance, according to a new U.K. study. This entry was posted in Active Living and tagged Active Living on November 6, 2013 by beth. Episode 1: Retrofitting Suburbia (preview all episodes here) from MPC on Vimeo. This entry was posted in Active Living and tagged Active Living, Complete Streets, Open Schoolyards on June 26, 2013 by beth. Activity is a critical part of a healthy lifestyle, and opening schooolyards provides spaces for kids to play. This entry was posted in Active Living and tagged Active Living, Infographic on June 17, 2013 by beth. Funding public health saves money and saves lives by preventing chronic disease. Communities are strongest when their members are healthy. This entry was posted in Public Health and tagged Clinical Preventive Services, Infographic on June 17, 2013 by beth. Secondhand smoke costs billions of dollars, causes illness, and is unsafe in any amount. See why smoke-free living is a vital step toward healthy communities. This entry was posted in Tobacco-Free Living and tagged Infographic, Tobacco-Free Living on June 17, 2013 by beth. What is a Joint Use Agreement? ChangeLab Solutions has put together a great explanation of Joint Use Agreements. Many communities lack safe, adequate places for children and their families to exercise and play. Schools might have a variety of recreational facilities—gymnasiums, playgrounds, fields, courts, tracks—but many districts close their property to the public after school hours because of concerns about costs, vandalism, security, maintenance, and liability in the event of injury. Most states currently have laws that encourage or even require schools to open their facilities to the community for recreation or other civic uses. Nonetheless, school officials may be reluctant to do so, cautious about the expense in times of increasingly tight budgets. The good news is that city, county, and town governments can partner with school districts through what are known as joint use agreements to address these concerns. Check out their Fact Sheet for more information. This entry was posted in Active Living and tagged Active Living, joint use, Open Schoolyards on June 14, 2013 by beth. 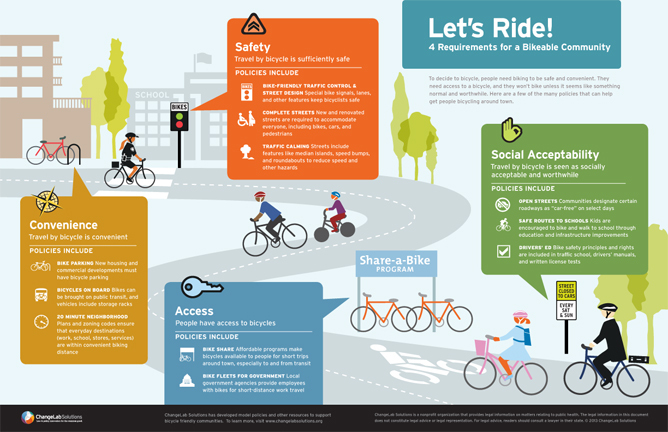 This entry was posted in Active Living and tagged Active Living, Complete Streets, Infographic on June 14, 2013 by beth. Streetfilms tells the story of an amazing project in Indianapolis, connecting bike infrastructure throughout the city with the heart of downtown. This entry was posted in Active Living and tagged Active Living, Complete Streets on June 14, 2013 by beth.